Over dinner, George Michael was on the radio singing 'Somebody to Love' with Queen. I said to my two young men, "This was originally sung by somebody else, do you know who it was?" The eldest (12) said, "Was it that guy with no shirt?" "That's right," I said, "What was his name?" "I'll give you a clue. 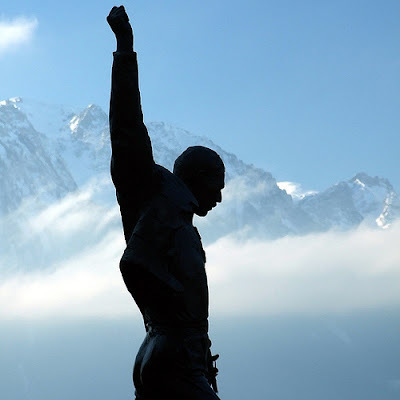 His first name was Freddie and his second name is also the name of a planet." I think Freddie might have quite liked that. LOL Exactly how does a dad explain to the 12 year old about Uranus? Don't scar the kid for life! *May even have been 1968. I take it that that is a different song than the Jefferson Airplane's "Somebody to Love" (here). He most probably would have written a song about it. Next thing Uranus won't be a planet either. Poor Pluto. Lyndi: Yes! :) Boy-Hemion Rhapsody perhaps... I'll get my coat. I thought it was Mars, seriously....lol...Happy blog hopping. I now have hope for future generations...I feared all sense of humor [even unintended] might be left by the wayside. Thanks for making me giggle on an otherwise giggle free day. That post was short and very sweet!! How could anyone despair for the future with kids like yours around? They're such great boys. Ken, do you want Auntie Beth from the US to explain things to him? I'm good with kids. No-I'm being serious, I'm good with kids, but never would I know how to even approach Uranus. And that so came out wrong, but I'm leaving it. I'll take Freddie Mercury for 200, Alex. FYI, Anne Hathaway sang "Somebody to Love" in Ella Enchanted. What an amazing voice she has. I'm sure he would have liked it, but the interesting question is whether or not your 12year old knew what he was saying. Hey!! I did a whole comment thing here the other day and now it's gone. Matt, Dave, Fiendish, Susan, Penny, Hope and Jena - I said such nice things too. Who moderates this place?? When my daughter was a little girl, probably about five, we were watching TV and The Beatles came on and I asked her, "Do you know who they are?" to which she replied, "Of course, Daddy - it's The Monkees."